Unique Moments Photography of Gig Harbor Washington Captured this image 3 yrs ago at an inside church ceremony. 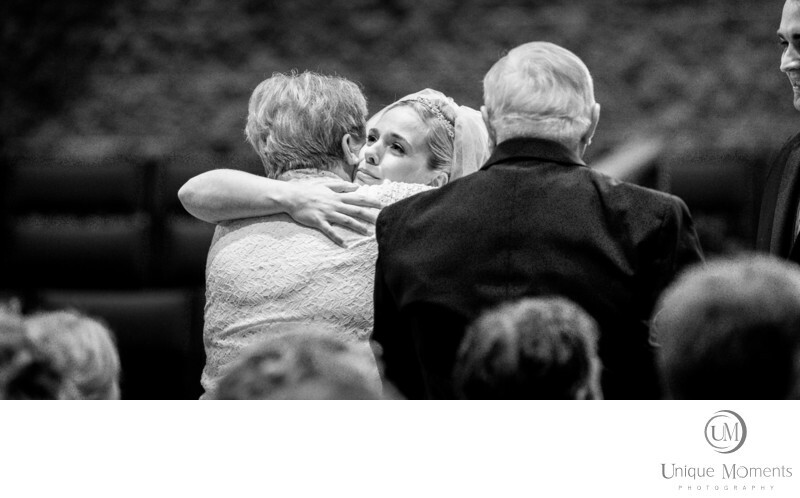 The bride saw her grand parents and became emotional. Human emotion is so powerful. It is the defining moments for photographers and what we feel photography is all about. We are constantly watching for human emotion to display itself because the images are always powerful and cherished by the family. Most people tend to call these images candids. We take a lots of candids when we are at your wedding.The entire ceremony is captured with the natural available light because we do not want a flash going off and disturbing your family. We never want to be a distraction at your wedding ceremony. Officiants tells us that they didnt even know we were in the room. We use long super telephoto lens and shoot into your ceremony to capture images. We will not be intrusive or a distraction for your ceremony. Your ceremony is for you and your family to enjoy. It is not a photo op for a professional photographer.